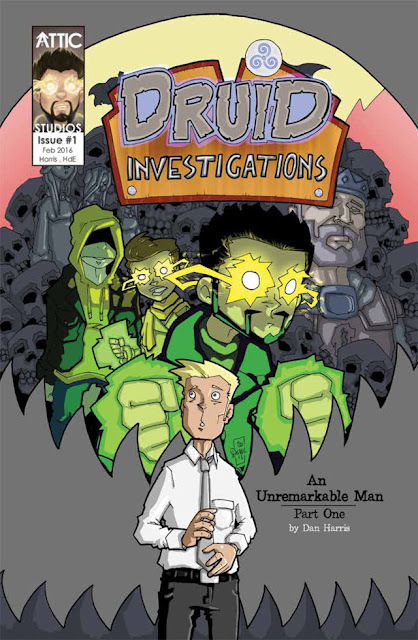 DRUID INVESTIGATIONS #1 Review | Warped Factor - Words in the Key of Geek. Gail Williams is loving the first issue of Druid Investigations. Merlin has failed, the King is dead, the age of magic is over. Welcome to somewhere in South Wales. It's seven a.m. and the alarm is going off. Our everyman, Killian Turner, gets up with the “Thank God it’s Friday” declaration, one I’m sure we’re all familiar with. It seems Killian works in a call centre. Hmm, Killian lives in South Wales. He works in a call centre (feels like the only growth industry around here sometimes). Do you think the author might just know the area well? After work Killian goes down the pub with his mates. He’s had a few by the time he decides to walk home. Alone. In the dark. So getting a trio running past him is probably a clean escape - at least they weren’t trying to mug him. In fact Killian is such a good citizen he tries to return a dropped pipe. I wonder if he even notices the tail hanging out of one of the runner’s jackets? But he follows them only to find… well… two magic users, a lizard man and a bloody great dinosaur, or possibly a dragon, not sure which. But it’s got big teeth. Big and soon to be bloody big teeth. Anyone surprised Killian pisses his pants? Because this is a brand new comic, that’s all the spoilers you'll get from me. Suffice to say that Druid Investigations is totally on the mark for observation and humour. And I’m loving the mates reference with the 'Moon' t-shirt too (that’s another indie comic I reviewed a while back). 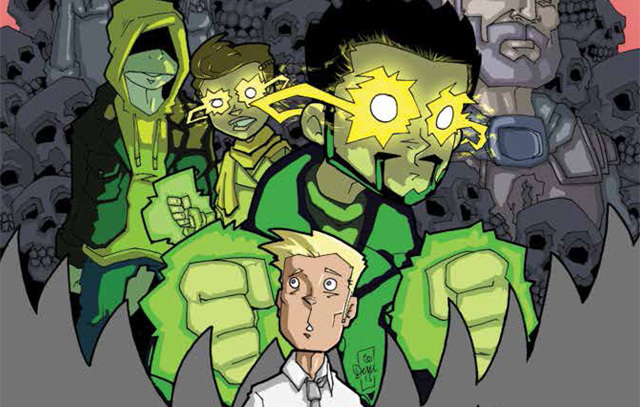 Some of you may have read my review of Lou Scannon, if you didn’t, go read it, and if you did and/or you have the comics yourself, then you’ll be pleased to hear that Druid Investigations is the latest offering from Lou Scannon artist Dan Harris. 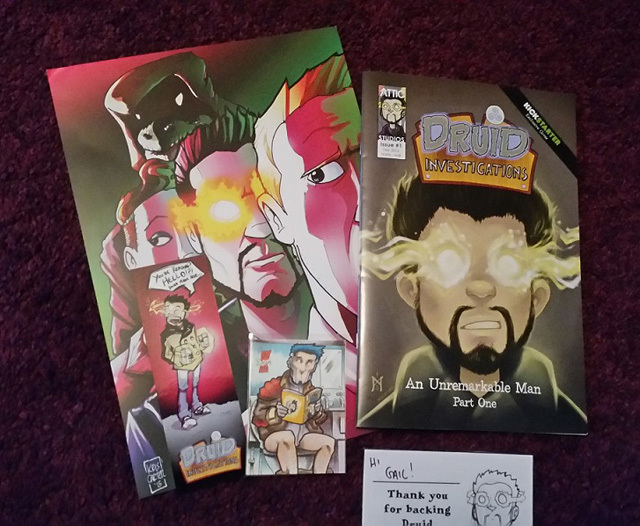 Now I’ve loved Lou since I first found him at a Cardiff Comic Expo a few years ago, so when I saw that Dan was doing a Kickstarter I was quick to put my tuppence in the tin - so quick I was in fact the first contributor. I must have reached the big time too because my name is in the back of the comic and everything - yeah, okay, that’s a standard contributor perk, but I’m there. If you need proof that it’s the little things in life that make it worth living, then see how I got a kick out of the contributor notice and how I’m pleased to have been able to do even one tiny bit to support this work coming to reality. Druid Investigations, like Lou Scannon, isn’t available in your comic shop, but they have set up a lovely new website: www.atticstudios.website, where you can pre-order your copy today.